It’s 4:00 a.m. and pitch dark outside. Our family of eight is snuggled in sleeping bags in our camper … but there is a stirring about. My dad is shaking shoulders and whispering to any takers that it’s time to rise and shine. If you’re coming you better get up now because the low tide waits for no one! A few siblings roll over and groan but I’m surely up for this lantern-lit adventure. 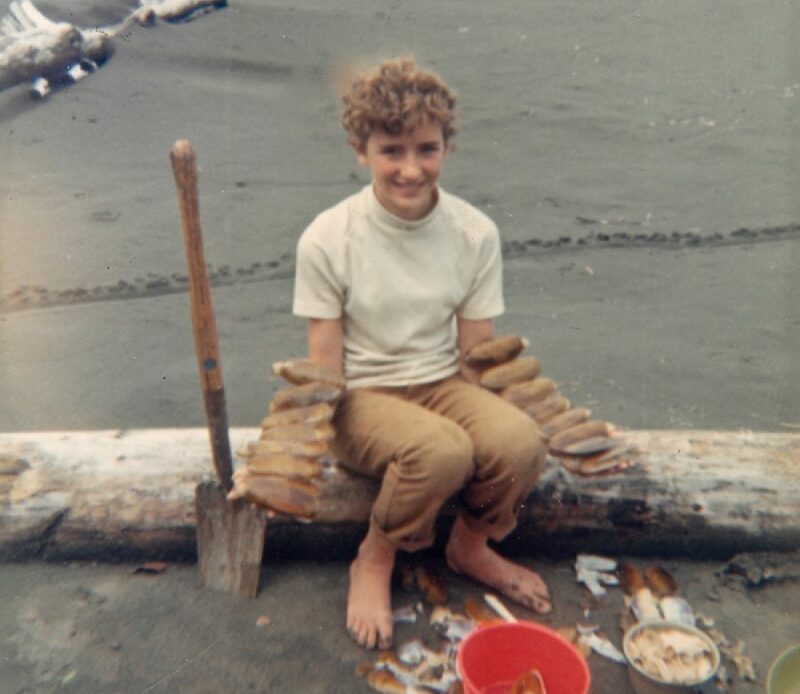 Digging razor clams with Dad was such a thrill. To this day the taste of pan-fried razors brings back the fondest of childhood memories. Pacific razor clams, Siliqua patula, are an unconventional breed. Their manners are questionable, as they tend to “spit” at diggers who are in pursuit with their shovels and pails. The shell of this sharp mollusk could give you a nice close shave, or even cut like a knife, but the meat inside is as innocent and tender as can be. The most sought after delicacy is the single extended foot it uses to dig with. This flesh is the very sweetest part, likely because of the glycogen (sugar for energy) stored in this hard working muscle. It has another good-sized adductor muscle that works to hold the thin shell closed, while it quickly slices through sand so it can hide at low tide. These clams can move at blade-runner speed siphoning water and sand, perhaps a meter in a few seconds, through their bivalve system. All those small mineral particles get filtered and digested, providing a strong nutrient content in the process. The iron found in clams in some cases rivals that of red meat. The other minerals found in clams include essential phosphorus, potassium, zinc and selenium. Its high vitamin C content is likely provided by the nutritious, microscopic seaweed and plankton it eats. At only 60 calories in a three-ounce serving, which in my mind is clearly not enough, clams are mostly protein and barely any fat. (Please don’t ask about the butter I like to sauté them in, I don’t believe those calories count.) Its delicious flavor is reminiscent of the sweet briny delicacy Abalone, but in my mind tastes even better. This precious, rare find is certainly worth digging at 4:00 a.m. Those perfect low-tide days are few and far between, and the time to hunt them is even more scarce. So in order to satisfy your craving for the illusive razor clam, Salty’s Chefs came up with some delicious dishes to serve you in November! Come check out Salty’s Fritto Misto served for one week only, from November 12 to 18, and take a look at Chef Jeremy’s great ideas in his Get Your Gun, It’s Time for Razor Clam Hunting!!!. No shovel necessary.